Arrival at Marrakech Airport. Once you have collected your baggage/bikes you will be met by our driver who will transfer you to the riad where you will spend the night. Today we have a leisurely start, giving us some time to fine tune our bikes before setting off across the Haouz plain in to the foothills of the Atlas Mountains. To avoid the monotony of the flat plain we load our bikes and take a minibus to transfer the 30 km to Kik plateau. 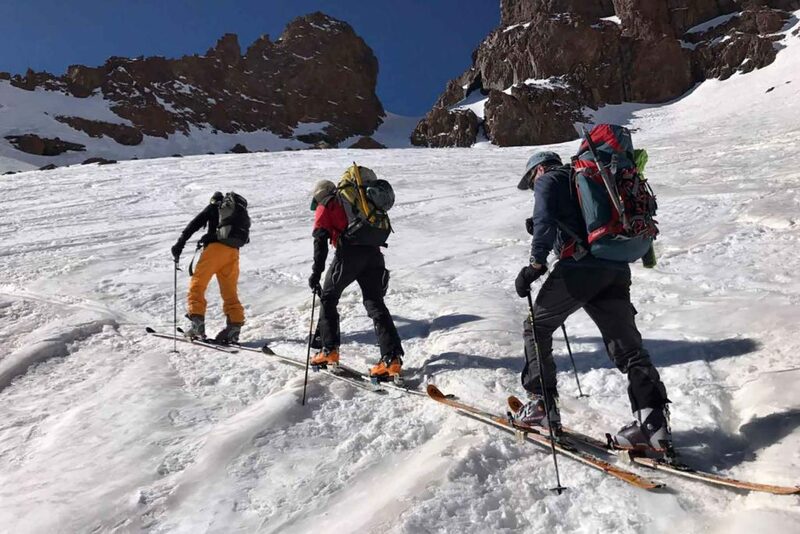 From here we have a day of climbing, descending and gradually from the plains into the heart of the Toubkal National Park. The first part of the climb takes us on a long windy mountain road perched above a steep-sided gorge leading us to the village of Asni, a traditional Berber settlement on the old Marrakech to Agadir road. Around Asni we will choose an nice spot for a picnic lunch before continuing along a quiet country road to Imlil. The road to Imlil climbs gradually for 17 km’s, following the beautiful Mizane Valley, a typically scenic High Atlas river valley with a thin strip of lush cultivation farmed by stark towering limestone mountains. Imlil is the most important trail-head village in the Atlas where trekkers set off to conquer North Africa’s highest peak, Mount Toubkal. We leave our bikes in the village and continue on foot up a dirt track to our accommodation for the night, a beautiful guesthouse nearby the village of Tamatert. After breakfast early morning we set off on foot to rejoin our bikes in Imlil. The walk down takes us through shady walnut groves and alongside the Mizan river in which water flous year around. In Spring the river turns into a torrent as a snow melt tumbles down of the Toubkal Massif. The first part of our ride retraces our route of yesterday afternoon, with a smooth fast descent down to Asni where we rejoin the old Marrakech to Agadir road. There then follows a twisty 10 km descent down towards the village of Ouirgane, one of the beautiful villages in the High Atlas. En-route walnut trees give way to olive groves as we lose all of the altitude we gained yesterday. Today the road surfaces are good although there is generally very little traffic on the road, riders should be on their guard for unexpected oncoming vehicles. Around the village of Ouirgane we will stop for lunch before continuing up to the Tizi ‘n Test road towards Ijoukak our overnight stop. Our afternoon ride following the course of the ‘NFis river takes us a further 30 km uphill along a quiet road. En-route we pass through some small Berber settlements. On arrival in Ijoukak we will add another 2 km south of the village to the accommodation which is basic accommodation with shared toilet facilities. Today we make an early start from Ijoukak as we continue our route southwards on a physically demanding ride. After Ijoukak the eoad begin to climb more steeply as it winds. Its way up to the infamous Test pass one of Africa’s highest paved roads. En-route we stop for a look around the Tinmal Mosque, one of Morocco’s oldest, the mosque dates back to the 12th century and was built by the same Berber dynasty who built the magnificent Koutoubia mosque in Marrakech. Moving on from the mosque continue our climb through Jupiter forest up to over 2000m above sea level. 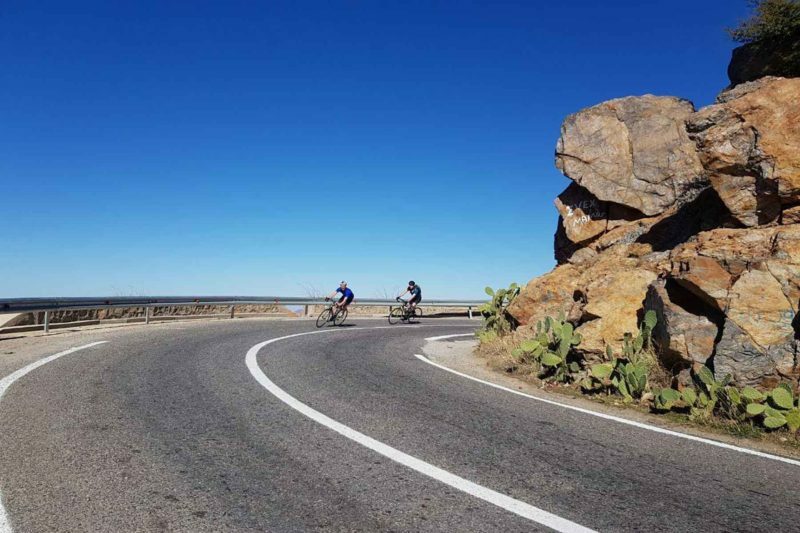 In total that climb is about 40 km of climbing since Ijoukak and the rewards on a clear day are panoramic view southwards over the Souss valley to Taroudant and across to the Anti Atlas Mountains. Somewhere around the summit of the pass we will stop for lunch before embarking on a 37 km descent down to the south side of the High Atlas Mountains towards the town of Ouled Berhil. From here you will transfer further to Taroundant where you can have a short look around the town before we drive further to Ait Ben Haddou where you will spend the night. A morning biking up the superb Ounila Valley on the tracks of the ancient salt and Sahara trade route. At Telouet we visit the “Kasbah du Glaoui” the fortress of one of the lords of the Atlas and a major actor during the protectorate period, Thami Glaoui. From Telouet, with a vehicle, we cross to the Northern side of the High Atlas by the Tichka Pass. Our day ends in Marrakech where you will spend the night in a riad. Free day to explore the magical city. Night in a riad in the medina.